The FlowMon product offers a comprehensive solution for network monitoring based on NetFlow. It consists of stand-alone FlowMon Probes, Plugins and Collectors. FlowMon Probes process and analyze every packet on wire-speed and generates NetFlow statistics. These statistics are exported to any NetFlow Collector to be stored and ready for user analysis and visualization by optional tool. The FlowMon Plugins enables user to take advantage of more sophisticated analysis or SNMP monitoring. This product is developed by INVEA-TECH company. The FlowMon Probe delivers the flow-based monitoring for all networks from 10 Mbps to 10 Gbps. The probe provides detailed NetFlow v5/v9 or IPFIX statistics about who communicates with whom, when, how long, how often, using what protocol and service or how much data was transfered. These statistics are necessary for network monitoring, security, troubleshooting, IP accounting and billing, capacity planning, user and application monitoring or traffic engineering. NetFlow Data Exported by FlowMon probe are transmitted to NetFlow Collector for further procession. The collector performs NetFlow data collection (from one or more probes) and enables a user to visualize and analyze network statistics. Every probe integrates a built-in NetFlow collector, which enables quick evaluation and usage of the NetFlow technology for all - network and security operators, administrators and managers. The main advantage of FlowMon probe is its ability to analyze every packet at wire-speed up to 10 Gbps. Unlike the routers, the probes are L2/L3 invisible appliances and mobile devices applicable in every point of network, so they are difficult to be attacked by a hacker. The probe placement location is usually an entering or exit point of analyzed network, critical points or links with highest bandwidth. The probe can be connected to the user network in three ways: via mirrored port (SPAN) of router or switch; via Ethernet splitter (TAP) directly into a monitored link or via built-in splitter directly into a monitoring link (accelerated models only). FlowMon Probe configuration is provided by user-friendly web interface of FlowMon Configuration Center. The probe setting process is very simple enabling the user to have a fully functional NetFlow monitoring solution in a few minutes. Once the probe is connected and configured it works automaticly with no maintance needed. The FlowMon probe comes in standard or hardware-accelerated version. The standard model offers solid performance for low price and is realized as a compact 1U appliance. It provides up to 4 monitoring interfaces for 10/100/1000 Ethernet (models FlowMon Probe 1000/2000/4000) or 1 monitoring interface for 10 Gb Ethernet (model FlowMon Probe 10000). It can capture up to 600 000 packets/sec, which is adequate for most of the networks. The accelerated model offloads NetFlow processing to the hardware and offers the best performance in the industry for wire speed packet processing on high-load networks. 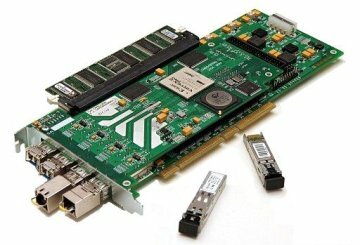 It provides 2 monitoring interfaces for 10/100/1000 Ethernet (FlowMon Probe 2000 Pro) or 1 monitoring interface for 10 Gb Ethernet (FlowMon Probe 10000 Pro). It can capture 3 million packets/s providing full 2x 1 Gbps throughput under all conditions. The accelerated model further offers built-in splitter which enables easy in-line usage of the probe and 2 additional mirror ports.